Rob. I can?t believe that I am trying to write this. I am undone. Let me say first that in a culture rife with hyperbole, each word has been carefully chosen here. I?m writing because as I clutch at memories of my friend they seem to vanish as I reach for them, and I want you desperately to know him and remember him. Rob was my best friend. Not only was he my best friend, he was ?a? best friend. I imagine that you could know Rob for about a minute and consider him your best friend. This was not because he was devoid of depth or flip about relationships, but rather because he was generous with himself and generous with his desire to see everyone around him become who they were created to be. He was an incredible man. He was an amazing Father and was the best husband, and he was my ?best? friend. I first met Rob about 14 years ago; he was introduced to me by my other best friend since he had just started dating his sister! I liked him immediately, but it wasn?t until that Christmas when we travelled to Carleton Place that I realised that God had indeed brought a kindred spirit into my life. We discovered that we had lived parallel lives in almost every sense. He had grown up in rural Ontario with a community church exploring community living, farming, worship. We both studied at University of Guelph (unbeknowst to each other we were there at the same time!) We both were very involved with our respective summer camps leading and counseling. We both volunteered in Guatemala, both were involved in youth leadership; both became youth pastors, both attended Wycliffe College (he finished!) In fact with both married Kates?! (while mine is a Cate!) I think I can actually pin point the moment our hearts made that ?God? connection?Rob used to love to tell this story too. It was after we had just torn our guts apart laughing about the tennis ball cannon that Craig had made as a gift for Rob, and had discovered that we both loved four wheeling?and that he still had that Toyota truck?so we took it out. As we came careening through the fields in the snow, I was driving. Before us lay a steep embankment and then the road. We both knew that we?d have to get some serious speed to get up, but that meant we wouldn?t be able to see any oncoming traffic. I geared down and we shot up the hill ? a vehicle was indeed coming so I cranked it to the right skidding and sliding along the top of the embankment as the car passed us, fishtailed left and pulled up on to the pavement! Whew! I can?t remember exactly what Rob said?.but we both had that feeling like? ?I think we?re going to get along just fine!? Our lives continued along very similar paths and would cross every now and then, but it wasn?t until Rob and Kate ended up in Guelph that our relationship really solidified. It mostly solidified in the middle of the night with many cups of coffee as we worked on any one of a number of construction jobs. Man we did some crappy jobs together ? united by coffee, the need to provide for our families and the knowledge that we would both have to go and youth pastor the next day! Rob and I could get more work done than anyone I know. In fact, in an ironic way Jesus taking Rob to be with him has confirmed my theological position that the Lord doesn?t need us to do anything for Him. If He needed us to get stuff done ? He never would have taken Rob ? Rob was probably His best option for getting stuff done! Rob was a dreamer, but he dreamed with his hands. We worked on projects all over, Hamilton, Parry Sound, Campbellville, Kitchener, Guelph, Milton, and Mississauga. 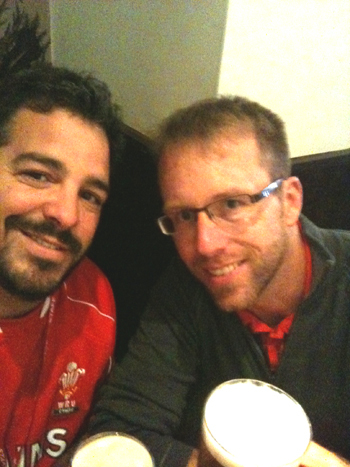 We watched soccer together, and drank our fair share of pints. Our families grew and just seemed to fit together ? we would make an annual camping trip. My kids are really struggling with not having Robbie there when we go camping next. Kate ? we will take you and your kids, we wouldn?t even dream of going without you. We walked similar paths theologically. We spent hours?nay, days even weeks discussing and talking and wondering about the God we served. Rob was unwavering in his faith. He was an inspiration, but he wasn?t arrogant or brash. The last time I saw my friend in the flesh we were in Scotland and he was in the middle of traipsing around Europe with his family. We spent a weekend together at a conference. In fact, in retrospect, God?s small mercies are incredible. I came home from that trip saying that I felt guilty ? here I was having travelled to Scotland to go to an international meeting and I spent 90% of my free time with Rob, Kate and the kids. Thank you Jesus. Our last moments together were spent in a pub in Edinburgh drinking 80 Shilling and wondering about Jesus into the wee hours. In fact, we stayed there so long I had to walk for over an hour to get to my accommodations since the city busses had stopped running! We talked about his conviction that this trip was the right thing to do, but that he had no money, no provision and wondered if he was dragging his wife and kids around just for his own fulfillment. That was Rob, convinced, taking the risks all of us are scared to take, but humble in the midst of it, humble to wonder at his own thoughts and decisions, but confident in His God. Hey Rob?I think it was a good decision to travel. I traded emails with Rob on the Sunday before he was killed. He was asking me about a roof he was working on putting a skylight in. I can only imagine it was the job that killed him. I told him I thought it would be OK what he planned and asked him to send me a picture so I could be sure. I know in my head this makes no sense?but I?m so sorry that I didn?t say it was a terrible idea and that he shouldn?t touch it. I?m so sorry Kate. I?m so sorry. Rob trusted God more than anyone I know. He always trusted that when he took that next step ? no matter how far down it might be, underneath were the everlasting arms. I am challenged by my friend ? I was challenged by his life, and I am destroyed by his death ? but I will not allow my grief to lead me to apathy or inaction. Rob?s life was lived for other people. Look through his blog and his heart is bursting with possibility for the people of a continent he loved. It wasn?t just Africa. It was everywhere he was. Two years ago we did a weekend in Toronto with a couple of his leaders and my son. It was an ?Urban excursion.? We walked and talked more than you ever could imagine. On the Saturday we were up earlier than everyone else and walked for hours ? ending up at a dive on lawn chairs in Kensington market eating some of the best bacon and eggs ever. We dreamed together, dreamed of starting companies that would put food on our families? tables but would allow us to pursue a dream of offering our lives to see people live to their fullest potential in Jesus. We then spent the day ?in character.? For the excursion we played different real life characters to experience life through their eyes. Robbie was pretending to be an exec who had contracted AIDS and needed support and health care. We wandered in and out of hospitals and hospices and tried to come to grips with what it would be like to live like this. I think Rob was amazing at this, amazing at perceiving the world from someone else?s point of view. Perhaps it is one of the reasons that he and Kate had such an amazing relationship ? their relationship was so full of creativity and passion. The connection, which we spoke about that day, is that it is impossible to have compassion unless you have imagination. Imagination is honed by creativity. When you can imagine what it would be like to have AIDS you can have compassion for that person ?real compassion. Rob was great at that. That sentiment swirls from the pages of his blog and rises in my heart as I read. Rob lived for his kids. I think that if he were here that would be his primary concern. He loved his kids. He was amazing with them too. His attitude, not that you need me to point it out, was that kids were part of everything that he and Kate did. They loved him so. He likely lived for your kids too. Our philosophies around raising kids and youth pastoring were so similar ? do life?bring them with you. It wouldn?t be weird for Rob and I to have a few youth from our respective groups at whatever construction project we had going on. No construction site will look the same any more to me; we had talked about working together when they returned, talked about so many things. Nothing can be the same ? when I think of all the pubs and coffee shops all over Southern Ontario that we spent time in, I can?t imagine how this will change us ? but let it not change this ? Jesus is on the throne. I don?t know why this has been allowed, but he is on the throne and He is King. Rob?s life has meant so much more than his death, and his legacy will be honoured and we will live differently because he walked this earth. I am reminded of a simple chorus we used to sing back in the day ? ?I don?t understand, but I love you Lord, I don?t understand, but I worship.? If you can, we are trying to raise funds for Kate and the three little kiddos as they arrive home to start rebuilding. You can do it here or check here for more info.